Yep. Skied Goldney Ridge to about 1548m. It was great to be away from crowds and up higher in the mountains. I did need my ice axe and crampons to ascend the ridge above the chute.Doing some proper ski Mountaineering for a change. The terrain at the top was pretty mellow with some cornices. 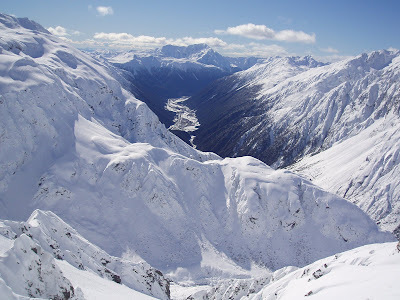 It was great to ski this ridge as it is so prominant to Arthur's Pass. I know some folks were a little concerned about avalanche conditions today which were posted as 'considerable'.I guess you know who your friends are if they arn't afraid to tell you when they think you are going wrong. So thats cool with me. 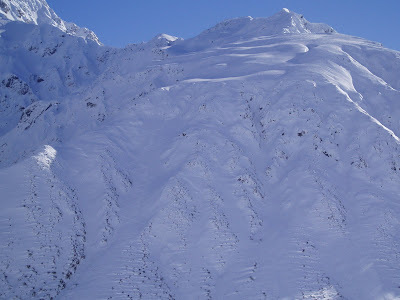 As far as avalanche assessment goes I dug three pits ascending the ridge one at the bottom, midway and the top. This indicated that the pack had consolidated considerably (moderate shear). The terrain was scrub, rocks and scree.Lower angled (apart from at the top). The aspect was mostly Westerly, but also there was a wall to the north providing shade to the chute. I noted no activity in the area, but noted some sluffing on NW slopes and a massive slab on the Goldney glacier (much higher and steeper. In skinning the chute I noted nothing suspicious - ski cutting produced only minor sluffs on steeper ground. With these factors I was confident to ascend the chute rather than what would have been safer terrain out on a ridge. That way I could also assess the snow I'd be skiing on the way down. There is no simple right and wrong with avalanches, so it is not a matter of being right or wrong. But making assessments based on experience and knowldge of Terrain, stability and the people factor. Today, given the factors mentioned above I think I did ok. 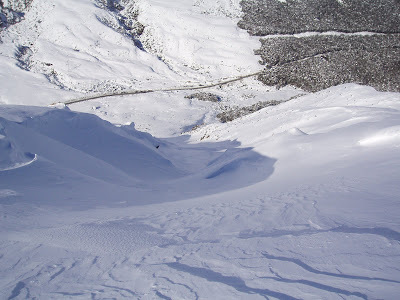 I skied the chute without incident which was awesome. 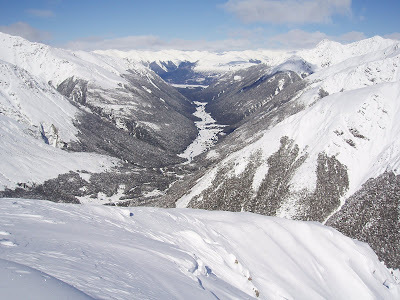 It will probably be another 15 years before it is skiable again. I'm also glad I didn't just stay at home because the avalanche conditions for the entire mountain range were posted as 'considerable'. I hope people give me a little more credit than that! You had to be there to make the choice, and not assess it from a distance too. Anyway have a look at the photos - enjoy. I also welcome comments if anyone wants to add to that????? Looked at that line a lot from Temple, but never looked close to being "In".